President Donald Trump is the drunk uncle demanding that the DJ at the cookout turn the music down because he wants to make a speech. Everyone knows what’s coming and everyone is nervous. On Thursday the president and our NATO cousins all got together for a little hangout time, and when Trump got the mic, they all braced themselves. 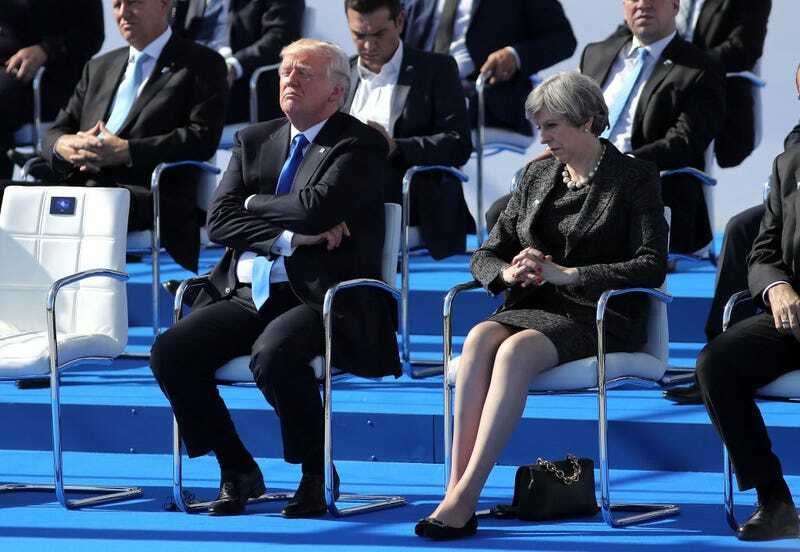 Trump not only asked for a moment of silence for those lost in Monday’s terrorist attacks but also took the opportunity to chide NATO-member countries about a debt that he believes they owe, except they don’t. “Members of the alliance must finally contribute their fair share and meet their financial obligations,” Trump said as some heads of state could be seen openly laughing and talking to one another, CNN reports. “Twenty-three of the 28 member nations are still not paying what they should be paying and what they are supposed to be paying for their defense. This is not fair to the people and taxpayers of the United States,” he said. As CNN notes, Trump keeps assuming and stating that NATO members aren’t meeting their financial requirements, as if NATO inclusion were a membership at Mar-a-Lago. “While Trump argued that many of the allies ‘owe massive amounts of money from past years,’ the 2% defense spending benchmark that allies must meet is designed to boost their military, not to funnel money to NATO or other allies,” CNN reports.